The governor's income was taxed at 18.5 percent for federal purposes, down from 19.6 percent the year before. ALBANY – Gov. Andrew M. Cuomo, who has spent most of the last two years railing against President Donald Trump’s tax cut law, will save $2,627 in federal taxes in 2018 compared to his 2017 tax bill, according to the governor’s income tax return released Monday. As a result of Trump’s tax law, Cuomo’s income was taxed at 18.5 percent in 2018 for federal purposes, down from 19.6 percent the year before. Trump and the Republican-led Congress passed the tax law in December 2017. It gave middle class families and corporations a tax break. But to pay for the tax breaks, the law also capped the deductibility of state and local taxes at $10,000. That means high-salaried taxpayers in high-tax areas such as Long Island and Westchester can no longer deduct the full value of state income and local property taxes on their federal tax returns. 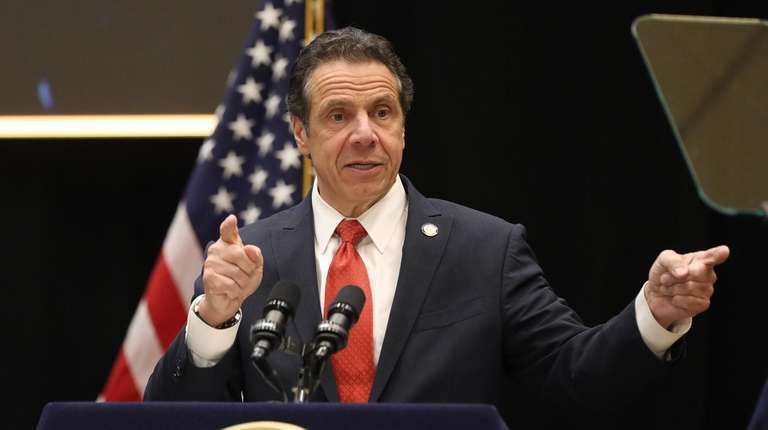 Cuomo said the federal tax bill would drive wealthy New Yorkers out of state and hurt all New Yorkers because the state is dependent on wealthy residents for significant chunks of revenue. Cuomo noted his federal tax bill would have been larger had he paid property taxes. He shares the Westchester home of his girlfriend, food TV mogul Sandra Lee, who claims property taxes on the home on her taxes, Cuomo officials said. Azzopardi said the federal tax law also resulted in a "double taxation" on part of the taxes the governor paid. Cuomo paid $12,894 in state and local taxes but could only deduct $10,000 because of the cap. So that means, Azzopardi said, the federal government is taxing the difference -- $2,894 -- which Cuomo already paid in state and local taxes. Cuomo contributed $11,000 to charity, all to the Help USA charity he founded, which builds housing for the poor. He gave the same amount to the same charity in 2017. Cuomo’s total income, including dividends from a blind trust of his investments and his $179,000 governor’s salary, was $211,289 in 2018. He is scheduled for a raise to $225,000 in 2020 and to $250,000 in 2021, which would make him the highest-paid governor in the country. The raises are part of salary increases for legislators, other statewide officials and top commissioners decided by a commission in December. Cuomo paid $39,138 in federal taxes and $12,246 in state income taxes. Lt. Gov. Kathy Hochul reported joint income of $876,252, mostly from her husband, former federal prosecutor William Hochul, who is now counsel to the Delaware North Cos., located in Buffalo. The company is an international food and beverage concession enterprise and also operates state-sanctioned casinos in New York State. Hochul makes about $150,000 a year as lieutenant governor. That, too, will rise under Albany’s pay increases to $190,000 in a year then hit $220,000 in 2021.